While attending Web 2.0 Expo in San Francisco, I had the chance to hear Bob Buch from Digg present tips and case studies on integrating social media marketing into your or your clients’ websites. “Each story that makes it onto the frontpage of Digg gets a minimum of 20,000 clicks back to the publisher. The best stories will get 200,000 – 250,000 clicks. Digg sends 80 million clicks per month to 3rd party websites,” says Buch. How are other sites benefiting? 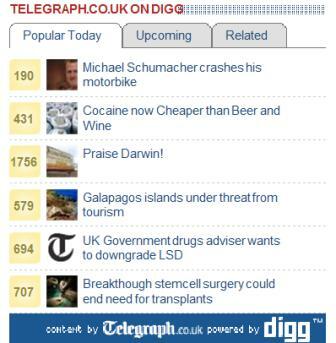 Telegraph.co.uk, the most successful Digg integration partner, and most popular broadsheet newspaper in the UK, gets 5.5 million page views per month from Digg users. In other words – less is more. The Smart Digg widget shows the number of votes to date and is massively more successful than a regular “Digg This” icon without the counter. One of the most popular elements on many content websites is a “Most Popular Content” box which highlights 5-10 popular articles based on recent page views. Time.com found that the “Digg Widget” integrated into their site, got 5X more interaction than their own “Most Popular Articles” box and massively increased their own traffic as a result of tons of additional Digging activity. Popular tech news publisher TechCrunch saw registrations increase by 100%, while capturing additional demographic data on their users by integrating Facebook Connect. While unusually successful, Bob notes that most websites see an increase of 30-80% increase in registration, and an additional 15-80% in comments and user generated content as a result of a clean Facebook Connect integration. You can even import user photos and other demographic data back into your site – such as location, gender, and other information that might otherwise drag down your sign-ups if integrated into your own registration process. One of the biggest successes of Facebook connect is being able to virally spread your message, by appearing on the “News” wall for users who use post on your site, vote, upload, or otherwise interact with your site. With each Facebook user having an average of 120 Facebook friends, this is a very quick way to expose your brand to a lot of people, really quickly, while providing “social proof”. Could Twitter Ever Replace Digg? Matt is the co-founder of SitePoint, 99designs and Flippa. He lives in Vancouver, Canada.